Topman are coming under pressure to withdraw a shirt some believe refers to the Hillsborough disaster. 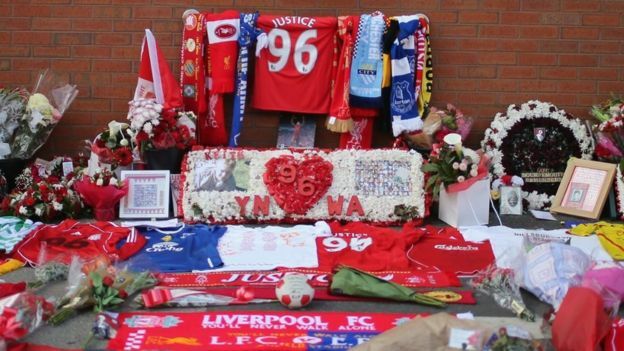 The red shirt with a large number 96 is being seen by some Liverpool fans as a reference to the club’s kit and number of victims killed in the 1989 disaster. Louise Brookes, whose brother Andrew was killed, and MP for Wirral South Alison McGovern are among those calling for it to be removed from sale. Topman are yet to reply but there is no suggestion of a deliberate reference. In a tweet, Labour MP Ms McGovern said the shirt was “very unfortunate” and should be “discontinued ASAP”. Ms Brookes, whose 26-year-old brother died at the stadium, said the phrases “karma” and “what goes around comes around” were used by some rival fans who claimed Hillsborough was “God’s punishment” for the Heysel disaster in which 39 mostly-Juventus fans died at a match against Liverpool. She also said the red colour, the number 96 and the rose were all symbols she associated with Hillsborough. Ms Brookes said: “I really do believe it is something to do with Hillsborough. She said whatever the shirt’s original message, “people will use it now as a way of antagonising Liverpool fans”. Ms Brookes said: “Our 96 were decent human beings who did nothing wrong. Some Twitter users have expressed their “disgust” and called for a boycott. Others called it “disgraceful“, “in really bad taste” and “offensive“. But others have said the shirt is nothing to do with Hillsborough and actually references a Bob Marley song. Others said Karma is a brand. Another, @98JamesConroy, said it was a “weird coincidence”. Several said Topman would not deliberately put a top out mocking Hillsborough.